Six of the seven Williamson County Republican candidates running for the Tennessee General Assembly explained their platforms Wednesday for Republican Women of Williamson County. Six of the seven Williamson County Republican candidates running for the Tennessee General Assembly explained their platforms Wednesday for the first time for the Republican Women of Williamson County. Three candidates are running for the Republican ticket for District 61 and District 65. Incumbent Glen Casada will not receive any challengers from the Republican side for the District 63 ticket. Fairview’s Stacey Givens was the only candidate unavailable to attend. Republican Women leaders said they held the get-to-know-the-candidates forum to help better their decisions before casting a vote. Each candidate had around three to five minutes to speak. Gawrys explained to the audience he ran for the same seat two years ago, where he was defeated by incumbent Charles Sargent in a close race. He owns several of the local Sonics in the area, employing over 600 people in the county, with about 250 of them being in District 61. He and his wife, Kim, a Brentwood High School graduate, have had all four of their children attend Williamson County Schools. He expressed while he and Sargeant were similar, they differed in some areas, particularly when it came to legislation going through the Budget and Finance Committee, though Gawrys listed no specific incidents in the committee. Gawrys said his primary concern was to limit government with concerns of what he considers oppressive regulations and taxation. Republican incumbent Charles Sargent said he considered the past legislative session successful and wanted to continue that pattern if he were to win re-election. Sargent has been involved in community government and the legislature for most of his life, having spent 20 years so far as a state representative. Originally from New York City, he was in the U.S. Navy in 1965 when the Vietnam War was building up. He moved to Nashville in 1970 and then to Franklin in 1977. He noted that he and other legislators had worked during the past four years to save Tennessee taxpayers nearly $500 million through the elimination of the Inheritance Tax, a reduction to 5 percent sales tax on food and the most recent Hall Income Tax. He further explained he helped champion the cause for more education funding, particularly when it came to earning back millions for Williamson County Schools after a shift of the Basic Education Program formula limited the amount of money the system would receive. He also recognized that the state didn’t take out any bonds this past legislative session, with assembly going forth and paying for projects. Brentwood resident Terrence Smith said he wanted to make his first political run based on his convictions for Tennessee values he considered under siege. Smith has lived in Tennessee since 2000, but is originally from Ohio. He’s held several occupations in his lifetime, from state trooper to physician. While he didn’t outline any particular pieces of legislation that concerned him, he explained he thought the state was hindered by an overreaching federal government, an activist judiciary and special interests groups that only represent a fraction of the population. He said he found the federal government “liberalist and socialist.” Smith said he was curious when the government would hear other hard-working Americans. 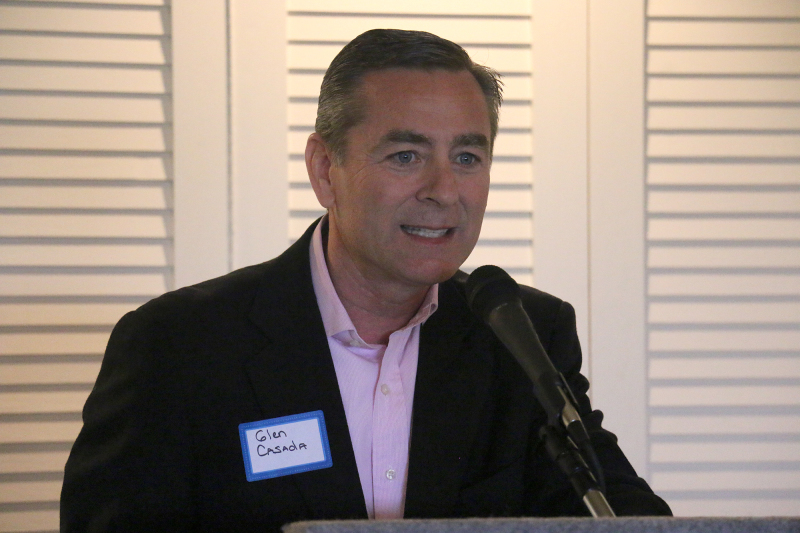 Incumbent Glen Casada will not face a Republican contender, but started his talk to the audience by criticizing his opponent on the Democratic ticket. Casada will face Franklinite Courtenay Rogers. He currently leads the GOP Caucus and has served in the District 63 seat since the early 2000s. He said his approach to the election would simply be to let his opponent talk. Casada primarily focused his short talk on immigration, explaining it had to come from a methodical place rather than letting anyone enter into the United States. He said the U.S. needs to allow a small amount of immigrants into the country at a time and let them adapt to American culture. Of all the Republican candidates, Franklin’s Jeremy Durham will receive the most in the way of competition during this next election cycle. Durham, the incumbent for District 65, focused much of his talk on remaining a “true conservative” for his constituency and explaining he was always there to listen to those in District 65. He’s held his seat since 2012 and was re-elected in 2014. Durham said he would continue to fight against any Medicaid expansion in the state and continue to take a stand against the “red tape” holding back small businesses. While he didn’t highlight any particular issue, Franklin’s Sam Whitson said he simply wanted to introduce himself before the audience on Wednesday. Joking this was his first public speech in more than 50 years, Whitson explained his military background and his desire to serve in the legislature to help ensure the direction in which the state is going. He doesn’t come from a political background, but served in the Army for 26 years with combat service in Iraq during Operation Desert Storm. Whitson has been active in civil life in Franklin and across Williamson County. He is involved in battlefield and historic preservation, serves as chairman of the City of Franklin Battlefield Preservation Commission and is a past chairman of the Carter House State Historic Site.